GOLD BEACH, OR (August 9, 2018) - Curry General Hospital has been recognized by the Office of Rural Health (ORH) as the Overall 2018 MBQIP Outpatient Top Performer among all 25 Oregon Critical Access Hospitals (CAHs) for reporting MBQIP (Medicare Beneficiary Quality Improvement Project) measures. ranked ABOVE the 90th percentile for BOTH State and National in all 4 quarters for "Median Time from ED Arrival to Provider Contact for ED Patients"
1 of only 4 CAHs who met a 90th percentile ranking on the above measure, and did so in ALL four quarters! CEO Ginny Razo is clearly pleased with the measure outcomes, and appreciative of staff's efforts. "Curry Health Network greatly values the efforts of Jen Klausmeier, RN and Tami Youngblood, Trauma & Quality Data Analyst, who gathered and analyzed data, and reported on numerous outpatient measures. Without their dedication, we would not have been recognized for this prestigious award," she said. Razo also commended the strong efforts of the entire staff which contributed to the measure outcomes ranking at or above State and National medians. "Our community should have confidence in the services provided by our Emergency Department (ED) staff. Thanks to the patient-centered and determined efforts of our ED physicians, Director of Outpatient Services Isaac Hodges, and the entire ED staff, patients were seen by a physician in only 3.5 minutes on average, whereas the State median time is 16 minutes and the National is 19 minutes." 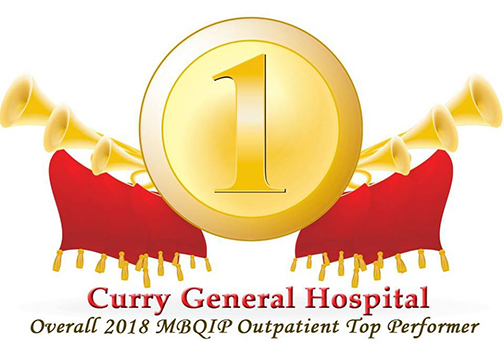 As recipient of the ORH's MBQIP Outpatient Overall Top Performer award, Curry Health Network will receive $5,000 to be used for a quality improvement project of its choosing that will help demonstrate improvements in a MBQIP-related domain or measure, or to begin reporting on a measure previously not reported. Youngblood and Klausmeier will also share a $700 scholarship to attend the 35th Annual Oregon Rural Health Conference in October when they will be recognized at the awards luncheon for their outstanding efforts.